This is a problem that occurs frequently with our Alexander Street Press streaming video collection. It's a result of a windows feature called "direct access" which is what allows users to access network drives while on campus. Unfortunately it can interfere with the authentication process that gets you access to some of our resources. The workaround is slightly different depending on what version of windows you are using. 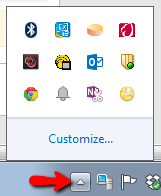 If you can't see this icon, click on the arrow in the system tray and then click on "Customize"
Next to "DirectAccess Connectivity Assistant," choose "Show icon and notification." Right-click the Corporate Connectivity icon. In the box that appears, click "Use local DNS resolution." 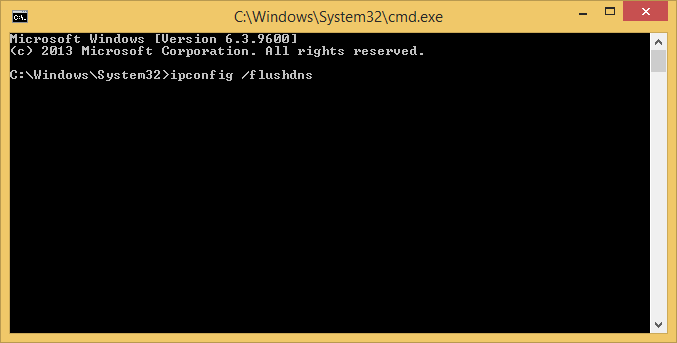 When in the command prompt, type "ipconfig /flushdns" without quotes, and press enter. close the command prompt, and that's it. You should now be able to access library resources from off-campus. NOTE: This workaround is not saved permanently to your laptop. Every time you open a browser session while off-campus, you should double check your "Corporate Connectivity" status and update it if necessary. Press Windows key (between Ctrl and Alt) and the "I" key to open the settings sidebar. click ""EKU Connection" and click disconnect.